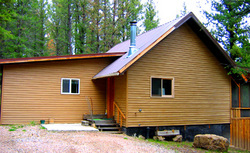 Private cabin, screened in porch, 2 twin beds, 1 full bed and a hide-a-bed couch. Furnished kitchen with dishwasher. One bathroom with shower only. Loft has the full size bed and bedroom has 2 twin beds. Propane heat for the whole cabin. Screened in porch lets you sit outside protected from the mosquitos. Private drive. Directions: From Butte, take I-90 to I-15 exit south. Continue on I-15 for approximately 25 miles to exit 102 to Highway 43. Travel Highway 43 for approximately 16 miles. Alder Creek Cabin is before mile marker 61 on the left before you head up the hill.